PHM-North America is saddened by the ongoing disaster on the Gulf coast of the United States. In the wake of Hurricane Harvey, Southeast Texas and Southwest Louisiana have incurred unimaginable damage. It will take a long time to recover from the damage caused by the storm and flooding, not only economically, but also physically and emotionally. We stand with victims of this disaster and wish to support them in the relief and recovery efforts however we can. 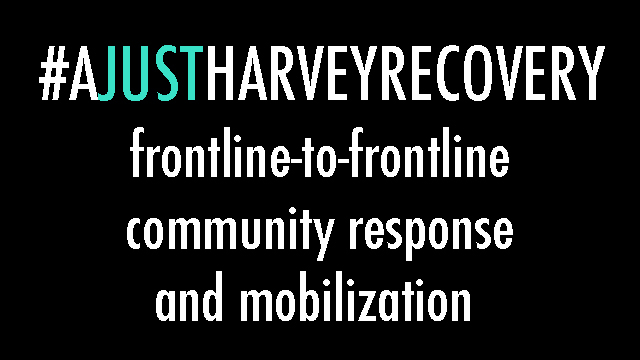 As a network of health and human rights activists, struggling for equality, justice, and the right to health, we support the call for “A Just Harvey Recovery”. We seek to amplify the voices stressing that these disasters are not only natural but are also a consequence of social, political, and economic systems that have failed to respond to them while protecting the most vulnerable people and communities. PHM in North America stands in solidarity with those who seek to build resilience and resistance in communities that are disproportionately affected by Harvey–not only to respond to the storm itself but also to the systems and the structures that have made them bear the brunt of the burden of this disaster. We support relief efforts on the frontlines and local organizations that will be on the ground long after the media has left and national and international spotlights no longer shine on the affected communities. We encourage everyone to support the relief and recovery efforts however you can. Another Gulf is Possible is a coalition of grassroots groups and activists organizing across the gulf, from Texas to Florida, and is leading the effort for #AJustHarveyRecovery. With attention to even the smallest communities affected, this site is serving as a central information source for frontline-to-frontline direct resource & support mobilization and will be continually updated with the most current information. Texas Environmental Justice Advocacy Services (t.e.j.a.s.) is a long-time friend of the People’s Health Movement and the oldest environmental justice organization in Houston. Through this storm, they have been monitoring and reporting on threats of pollution from refineries and chemical plants in the area that have been damaged by the storm. The extreme enforcement policies of ICE and Texas’s recent SB4 legislation, cracking down on leaders and law enforcement in sanctuary cities, has put migrant workers and refugees in increased harm’s way through the crisis. RAICES, with offices across in Central and South Texas, provides free and low-cost legal services to underserved immigrant children, families and refugees. They are mobilizing to get aid directly to immigrant families. National Nurses United (NNU)’s Registered Nurse Response Network (RNRN), a national network of volunteer nurses, deployed its first delegation of RN volunteers to Houston, on August 31 to work with locals on providing medical assistance in the wake of Hurricane Harvey. The Texas Workers Relief Fund, overseen by the AFL-CIO, was established to assist workers and families in times of need. It works with local affiliates to help stabilize situations when issues such as natural disasters occur. The Houston Independent School District Foundation is accepting donations to help families through the recovery. Lone Star Legal Aid provides free and low-cost legal representation to Texans living in poverty, including in the East Texas and Gulf Coast regions, to advance civil rights and access to justice. Across the region attorneys are working to provide legal counsel and pro bono representation to those in need who could not otherwise afford it. Southwest Louisiana Legal Aid and Acadiana Legal Services Corporation provides low-cost and free legal services to the economically disadvantaged in southwestern Louisiana. The Coastal Bend Disaster Recovery Fund accepts charitable donations and distributes recovery grants for counties in Texas’s Coastal Bend region, which includes Rockport, Port Aransas, Arkansas Pass, Corpus Christi, and other towns along the gulf coast which suffered the direct impact of the hurricane. Greater Houston Community Foundation’s Hurricane Harvey Relief Fund, set up by Houston’s Mayor Turner in response to hurricane Harvey, accepts tax deductible donations for victims of the floods.